There are good reasons why hardware geeks have a love-hate relationship with benchmarks. Benchmarks are the givers of pleasure and pain. Their verdict determines whether your beloved rig is a Godzilla or a Grandpa. As personal computers have become boutique items, the bragging rights inherent in owning the fastest system have become coveted ground. Once the province of the pocket-protected few, benchmarking software has flourished and become mainstream in the current hardware-rich market. Not all benchmarks are created equal, however. One case in point is the ubiquitous 3DMark, which despite its gaming utility and visual splendor isn’t a particularly good gauge of general application or OS performance. There are also some surprising gaps when it comes to system measurement; for example, how does your PC stack up against a Mac? Maxon’s Cinebench (free) answers these questions and more. Who says benchmarks are boring? Cinebench is a visual treat. 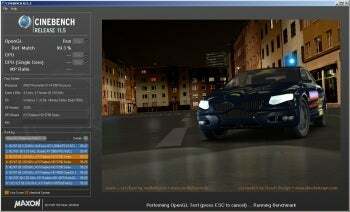 Cinebench tests CPU and OpenGL performance using the popular Cinema 4D rendering package (used in movies such as Ironman 2, District 9, and 2012) as the basis for a series of real-world tests, including a scene render and car chase. Results are easy to understand, contextually ranked against similar systems according to criteria you select. Since the engine behind Cinebench is derived from a commercial product aimed at the film production and content creation market, it is capable of scaling far beyond many conventional desktop and gaming benchmarks, which tend to plateau and lump high-end systems together. Not sure if you can notice the difference between a Core i7 vs. an i5? Watch Cinebench perform a scene render test on each and you’ll see where your money went. Since Cinebench runs on both PC and Mac systems, it’s also one of the few ways to perform cross-platform comparisons in a credible fashion. Maxon even provides Cinebench with a modicum of style. The user interface is appealing, the rendered test scene attractive and the OpenGL car chase slickly pulled off. Glitzy gaming-oriented benchmarks don’t have much to worry about, but in the less flashy waters where Cinebench swims, visual flourishes like these make it a movie star. It’s also pretty swift to produce results, although the single core render test is by nature slower on older systems. Cinebench isn’t without foibles. There’s no easy way to run continuous tests via the GUI, and data export seems to be accomplished largely via #2 pencil or screenshot. Also, tests such as hard disk throughput are beyond its scope. Still, this is quite an impressive, polished packaged for free. Hats off to Maxon on this one; Cinebench is a winner.